A quick note from Bonddad: with the market closed on Monday, we'll be back on Tuesday. This was a sparse week for new data, but what data there was finally put the fear of double-dip recession on people's minds. This fear is something I predicted back in January would come to pass about now, due to Oil and austerian idiocy. As it turned out, there was a big assist from Japan as well. The rear view mirror showed first quarter GDP unchanged at +1.8%. In monthly numbers, new home sales were up, but still bouncing along the bottom they established two years ago. Durable goods orders declined more than expected, but keep in mind that those surprised strongly to the upside a month ago. Averaging the two months together gives us +0.4% a month which is probably the better view. Real income and spending were flat for the second month in a row. Consumer confidenced bounced back from it March - April levels ... to its January - February levels. Oil finished slightly above $100 a barrel on Thursday. It still remains slightly above 4% of GDP. Gas at the pump finally fell, declining $.11 to $3.85 a gallon. Gasoline usage at 9025 M gallons was 0.8% lower than last year's 9099. This YoY comparison has been negative for the last eleven weeks in a row, but the YoY comparisons are not so negative as they were a few weeks ago. 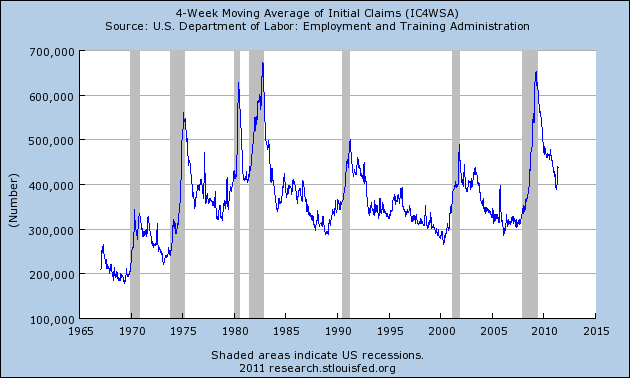 The BLS reported that Initial jobless claims last week were 424,000. The four week average is now 438,500. 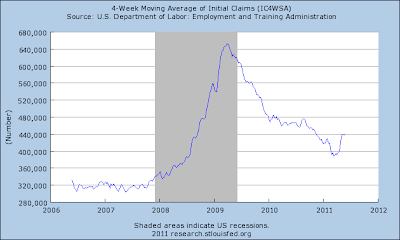 I expect it to abate next week when the 478,000 weekly number rotates out of the average. 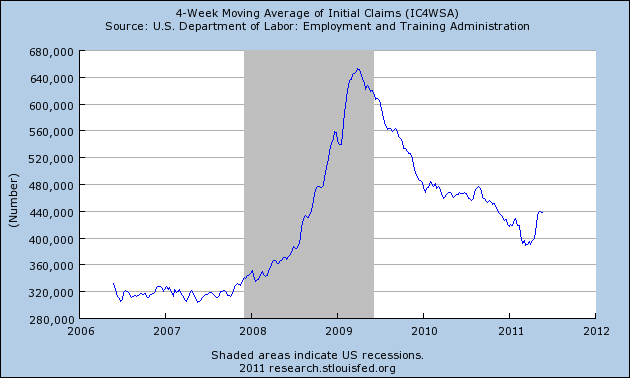 In the meantime, don't be surprised if we get a sub- +50,000 May nonfarm payrolls next week. Railfax was up 5.0% YoY for the week, or 20,000 carloads. This is the best weekly YoY gain in a while, but it reflects more weakness at this time last year than strength this year. The Baseline traffic 4 week moving average is up 3.13% from a year ago. Cyclical traffic is up 2.40%. Intermodal traffic (a proxy for imports and exports) is 3.45% compared with a year ago. The Mortgage Bankers' Association reported an increase of 1.5% in seasonally adjusted mortgage applications last week. It was 0.8% higher than this week last year. With the exception of the onset and ending of the $8000 mortgage tax credit, this is the first time since 2007 that the YoY mortgage applications number was positive. Refinancing increased 1.9% to a 5 month high, reflecting the continued decline in mortgage rates. The purchase series has now been generally flat for one full year - compared with its previous relentless decline, a good thing. The American Staffing Association Index remained at 94 for the second week. This advance looks very much like the first half of 2007 - slow growth, but not stalled. The ICSC reported that same store sales for the week of May 21 increased 3.1% YoY, but declined -1.0% week over week. Shoppertrak reported a very strong 7.7% YoY increase for the week ending May 21 (after a similarly strong 8.3% YoY increase the week before) and a WoW decrease of 0.3%. Weekly retail sales numbers have been a bright spot all year, generally showing the consumer not rolling over due to gas prices. Weekly BAA commercial bond rates dencreased .07% to 5.76%. This yields of 10 year treasury bond decreased .05% to 3.15%. The decline in treasury rates over the last few months does show fear of deflation due to an economic slowdown, but the decrease in corporate rates does not reflect any relative distress in the corporate market. Adjusting +1.07% due to the 2011 tax compromise, the Daily Treasury Statement showed that for the first 18 days of May 2011, $119.5 B was collected vs. $116.6 B a year ago, for an increase of $2.9 B YoY. For the last 20 days, $130.0 B was collected vs. $116.4 B a year ago, for an increase of $15.6 B, or 11%. Use this series with extra caution because the adjustment for the withholding tax compromise is only a best guess, and may be significantly incorrect. Like Railfax, this week this number more reflects unusual weekness last year than strength this year. M1 was up 0.4% w/w, up 1.8% m/m, and up 12.2% YoY, so Real M1 was up 9.1%. M2 was up 0.1% w/w, up 0.7% m/m, and up 4.9% YoY, so Real M2 was up 1.8%. Finally, R.I.P. Mark Haines. The irascible, hilarious CNBC anchor made financial news entertaining. And he didn't suffer BS from anybody. There are no more like him. He will be missed. There is NOT going to be a double-dip recession, although a further slowdown or even a stall this quarter and/or next cannot be ruled out. The fear will serve to help Oil prices reverse, just as they did last year. When that choke collar loosens, the economy will accelerate once again. Enjoy the first weeked of summer. I plan on enjoying some brats and beer myself. At the same time, keep in mind that Memorial Day is specifically for those who gave their lives in defense of this country. See you next week! There are three areas of the economy that are causing me concern. 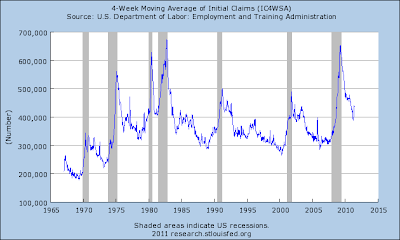 The above chart shows that, overall, the trend is still lower and that claims have made decent headway from their highs. However, also note that we're still not below the 400,000 level in any meaningful way. The above chart shows the number started dropping for a second time in the latter half of last year. But we've recently seen a spike that is most disconcerting. I've seen various explanations for the above numbers, with the most logical being that high fuel prices are forcing employers to cut other expenses -- namely, payroll. With the recent drops in three Fed region manufacturing indexes (Philadelphia, Dallas and Richmond) -- and manufacturing being a key driver of the current expansion -- these data series are disproportionately important. 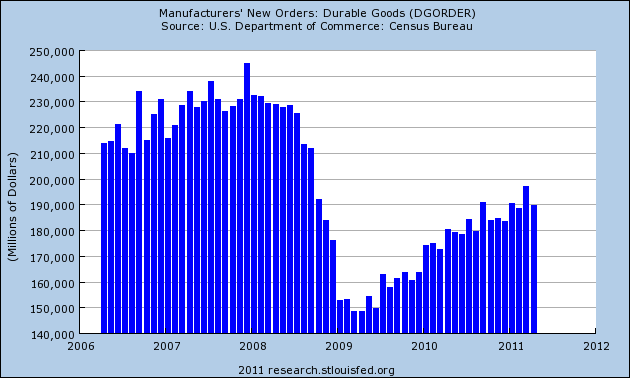 The durable goods chart is starting to look a little better. However, I'm going to reserve judgement for the next few months as we get more information about the manufacturing sector. When you combine all this with the recent slowdown news from the various regional Fed indexes, you get some possible problems. I should add, that the vast majority of the regional Fed indexes are still printing strong future expectations numbers. This tells us the participants in the sector see the current manufacturing situation as temporary. I'm guessing that most people are thinking the problem is primarily centered on Japan digging out from the earthquake. But with India, China and Brazil facing higher inflation -- and with their respective central banks looking to slow that inflation by raising rates and reserve requirements -- I have to wonder whether the slowdown is more than temporary. 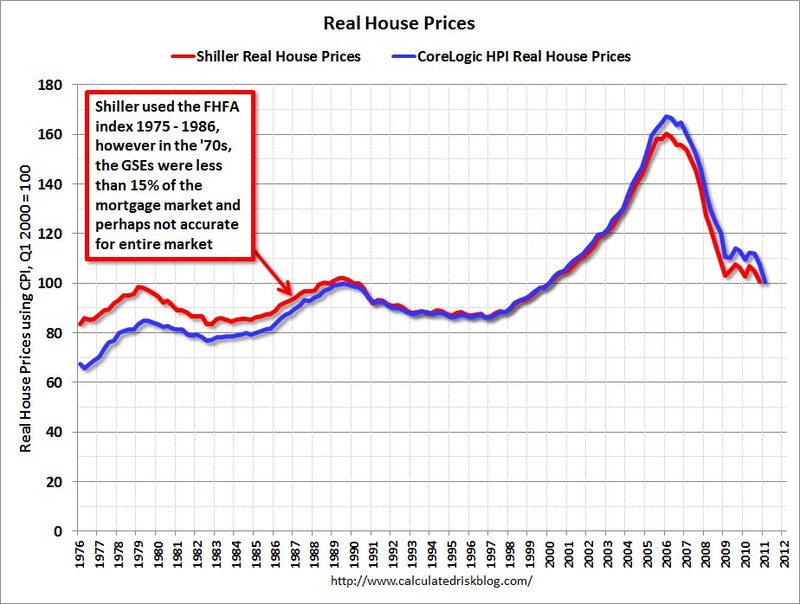 While prices ticked down recently, they are still high enough to choke the economy into slower growth. As I noted in the latest retail sales figures, consumers are shifting their spending to core items (food and gas) at the expense of other purchases. These three areas add up to a slowdown. Now the question becomes how long will it last? Right now, we're in the middle of a technical bounce higher so far has not disrupted the overall trend. 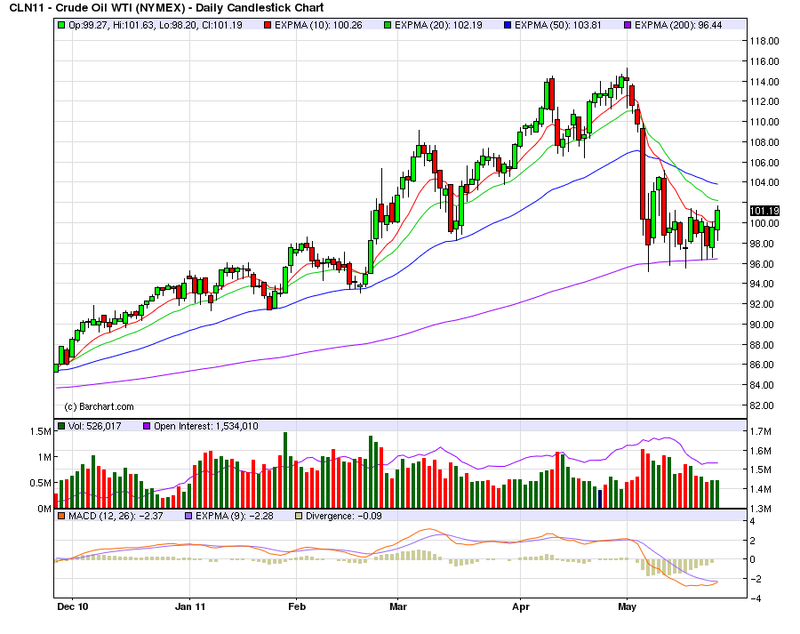 A strong move above the 50 day EMA over the next week or so will change that. In addition, if we see important technical crossings (the 10 or 20 moving over the 50) a re-evaluation will be necessary as well. However, if you played the technical bounce, I'd take money off the table now and wait to see how the market plays out. Ultimately, I'd still be looking for a longer shorting opportunity. Something I did not consider in my analysis last week (and which was very short-sighted of me) was the above chart, which shows the long-term downtrend of the dollar. Prices hit this level and then moved lower. On the shorter chart, notice that prices did move above the 50 day EMA, but his resistance at two levels. They have since move back down to the EMAs for support. However, the 50 day EMA is now a little bit better than horizontal and the shorter EMAs are about to give a buy signal. The A/D line has dropped a bit and the CMF is showing a negative reading. Also note the MACD is weakening. While prices have moved above the 50 day EMA and the shorter EMAs are moving higher, I am skeptical of the dollar making a big move up at this point. GDP reprinted at the 1.8% level -- which is pretty weak -- and there is little reason the Fed will raise rates anytime soon. I would only be a buyer if prices moved above the longer term moving average. If prices move below the EMAs, I'd wait for a rebound into the EMAs before shorting. Food inflation in India accelerated in the week ended May 14, diminishing hopes of any near-term relief for consumers from red-hot prices and mounting pressure on the central bank to tighten monetary policy more. The wholesale price index for food articles rose 8.55% from a year earlier, quicker than the 7.47% rise in the week to May 7, according to data issued Thursday by the Ministry of Commerce and Industry. The index was up 0.6% to 186.7 week-on-week. Bond prices fell slightly, with the 8.08% paper maturing in 2022 down at an intraday low of 96.92 rupees from 96.96 rupees before the data and 97.17 rupees at Wednesday's close. Rupa Rege Nitsure, chief economist at state-run Bank of Baroda, said the Reserve Bank of India will likely maintain its tightening bias for quite sometime as food and fuel prices aren't expected to fall anytime soon. The RBI has raised its lending rate by 2.5 percentage points since March 2010 and is widely expected to increase it by up to one percentage point more by next March. As China, India and Brazil continue to deal with high inflation, the rest of the world will continue to have slower growth. Yesterday, Macroeconomic Advisors cut their 2Q GDP forecast, which caused Professor Brad Delong to say "IT'S TIME TO PANIC !! ", which in turned caused Professor Paul Krugman to reiterate his "Third Depression Watch," which in turn has caused Doomers everywhere to cream themselves in barely concealed delight. ... in March or April, a debt ceiling increase will have to be passed. This Congress gives every indication of preparing for first class brinksmanship and idiocy on that score - meaning that either a government shutdown and/or default will actually occur, or dimwitted austerity measures will pass. So much for the second quarter. And I've been noting since at least March 25 in my Weekly Indicators column that "it appears that the Oil choke collar is indeed beginning to constrict the economy." But here's the thing: GDP for the first quarter was just revised from 1.8% to .... 1.8%. And Macroeconomic Advisors' downgrade of forecasted 2Q GDP was from 3.2% to 2.8%! In other words, the blogospheric Doomgasm has been prompted by fears that the economy will grow 1% more this quarter than last quarter! For the record, I still see a slowdown or stall this quarter and/or next. And this is still going to be a long, hard slog of a recovery, and yes it would be nice if somebody in Versailles actually gave a damn. 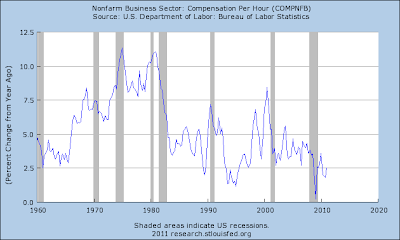 I just wanted to add that I've also noted the same issues (a slowing economy) here and here. In other words, readers of this blog -- data driven and wonky that it is (with pretty graphs to portray numerical data over a time) -- knew what was happening. And neither NDD nor I are saying the world is coming to an end, or that we're in a depression or that the pits of hell will open up and swallow us whole. I do want to give NDD a big hat tip for catching the issue far earlier than I did. Thankfully, I've given up betting him on his economic predictions! I detest Donald Luskin. He is intellectually lazy and shallow; his commentary is nothing more than oft repeated catch-phrases. Most importantly, if someone offered him the same amount of money to say the exact opposite thing I'm sure he would. John Galt is a fictional character in Ayn Rand's novel Atlas Shrugged (1957). Although he does not appear in person until the last third of the novel, he is the subject of its often-repeated question "Who is John Galt?" and of the quest to discover the answer. As the plot unfolds, Galt is acknowledged to be a creator, philosopher, and inventor who symbolizes the power and glory of the human mind. He serves as an idealistic counterpoint to the social and economic structure depicted in the novel. The depiction portrays a society based on oppressive bureaucratic functionaries and a culture that embraces stifling mediocrity and egalitarianism, which the novel associates with socialistic idealism. In the novel's ideology, the industrialists of America were a metaphorical Atlas of Greek mythology, holding up the Earth, whom Galt persuades to "shrug," by refusing to lend their productive genius to the regime any longer. So -- the world becomes so oppressive that the people who created vast wealth stop contributing to it. 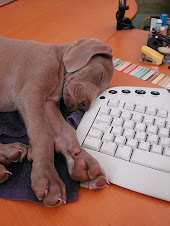 Mr. Luskin -- and I say this with all sincerity -- please go Galt! Stop writing stop appearing on TV, stop consulting -- please just go away. Take your ball and go home. Which is for the Fed to consider using the cost of labor as the preferred measure to determine Fed interest rate action. This paper assumes that a central bank commits itself to maintaining an inflation target and then asks what measure of the inflation rate the central bank should use if it wants to maximize economic stability. The paper first formalizes this problem and examines its microeconomic foundations. It then shows how the weight of a sector in the stability price index depends on the sector’s characteristics, including size, cyclical sensitivity, sluggishness of price adjustment, and magnitude of sectoral shocks. When a numerical illustration of the problem is calibrated to U.S. data, one tentative conclusion is that a central bank that wants to achieve maximum stability of economic activity should use a price index that gives substantial weight to the level of nominal wages. I think it's an interesting idea. The primary argument against this idea is it will penalize people for getting pay increases. However, remember that pay increases occur at the macro level for two reason: very low unemployment, which gives the job seeker more bargaining power when seeking a job, and high inflation, which forces people to ask for a raise to pay for the cost of living increases. 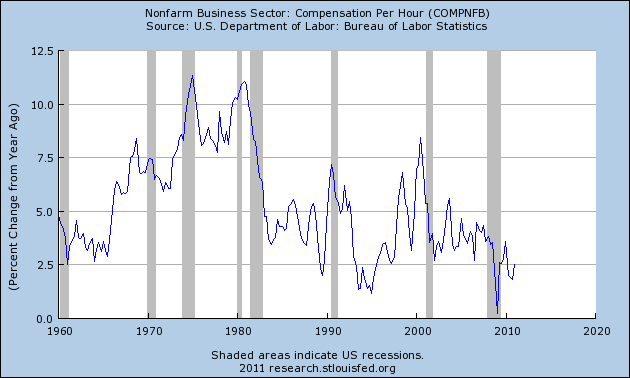 In either case, there is obvious inflationary pressure in the economy that may require Fed action. So, a move below 96 is a good shorting opportunity. I would wait to go long at levels above 104; there is simply too much traffic below that level to get through to go long before that point. Prices are using the 200 day EMA for technical support. The 20 and 50 day EMAs are moving lower, while the 10 day EMA has just moved sideways. Pay particular attention to the MACD, which appears to be ready to give a buy signal. While I gave 96 as a shorting level least week, this week I would make it the 200 day EMA. In addition, I would still wait until prices moved about the 104 price level as this would get them above technical resistance and through the EMAs. Manufacturing activity in the central Atlantic region paused in May, after expanding during the previous seven months, according to the Richmond Fed's latest survey. The index of overall activity was pushed into negative territory by weak readings for shipments and new orders, while employment growth held steady. Other indicators suggested additional softness. District contacts reported that capacity utilization turned negative and backlogs fell further, while delivery times grew more slowly. In addition, manufacturers reported an uptick in finished goods inventory growth. Despite the recent decline in activity, manufacturers were generally optimistic about their future prospects in May. Survey contacts at an increasing number of firms looked for solid growth in shipments, new orders, capacity utilization and capital expenditures over the next six months. This is further evidence of a broader manufacturing slowdown taking place. Sentiment remains sour, with increased chatter of an economic “slow patch” addling investors. Late yesterday, Applied Materials added to that discussion when it reported robust second-quarter earnings — and then warned of sluggishness up ahead. Its shares fell 2% after-hours. Technology stocks, like Applied Materials, have struggled throughout May amid a rising chorus of slowing business activity. Even storied Apple is flagging, its shares down 6% in the past month. There’s a gnawing sense that folks faced with still-expensive gasoline aren’t splurging on fancy gadgets, or much of anything. Johnson Redbook reported Tuesday that retail sales fell 2.6% in the first three weeks of May compared with the previous month. Reflecting the fretting about the economy, J.P. Morgan downgraded its second-quarter growth expectations to 2.5% from 3.2%. The main culprit: weaker auto production, largely due to supply disruptions caused by the March Japanese earthquake/tsunami/nuclear disaster. 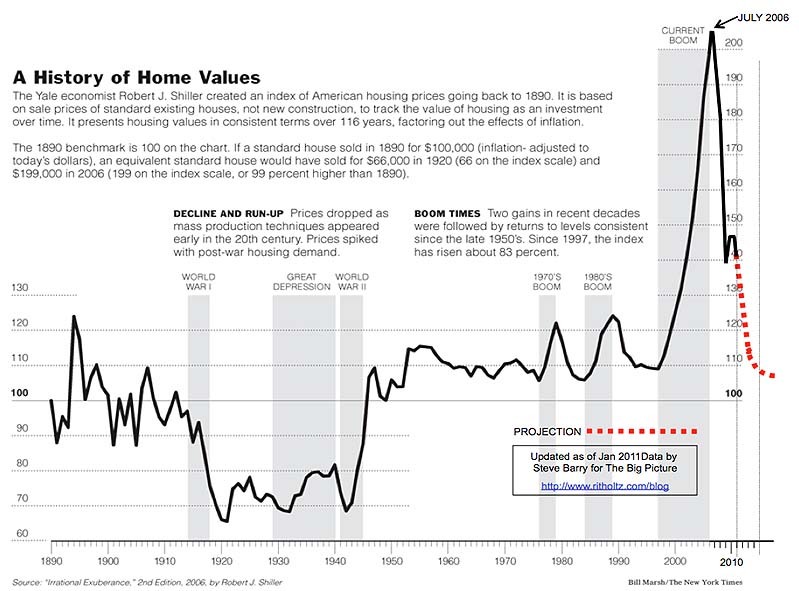 Will Home Prices Fall Any Further? 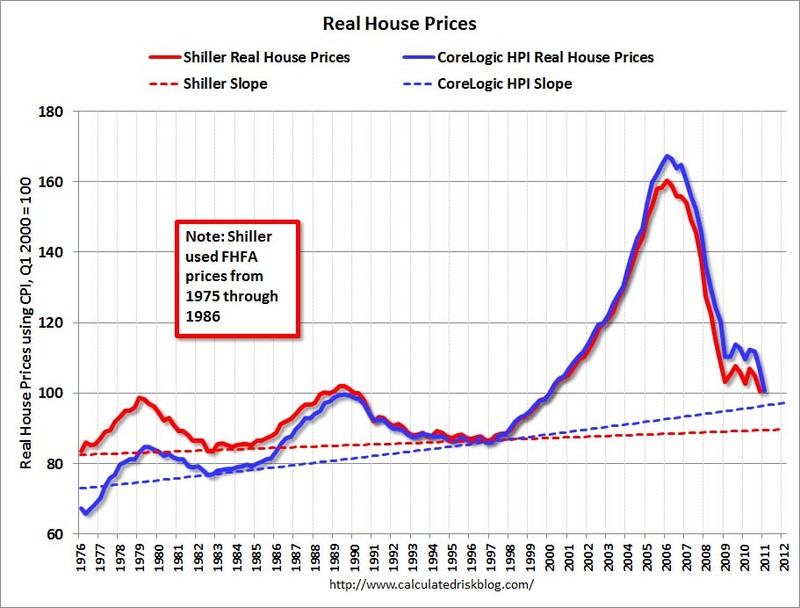 There's been a great debate/discussion in the economic blogsphere between David Altig at Marcoblog, Barry Ritholtz and Calculated Risk about housing prices. 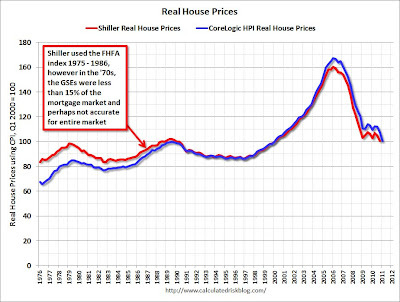 The topic is simple: how much farther (if anywhere) do home prices have to fall? First, let me post the various graphs from the previously linked posts to show on what everyone is basing their argument. 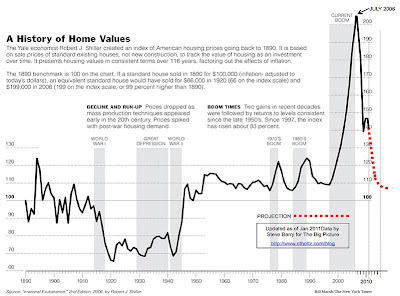 In other words, the cost of buying a home is cheaper then the amount of get you get for the home. In other words, there is a bullish spread between the purchase cost and return on investment. 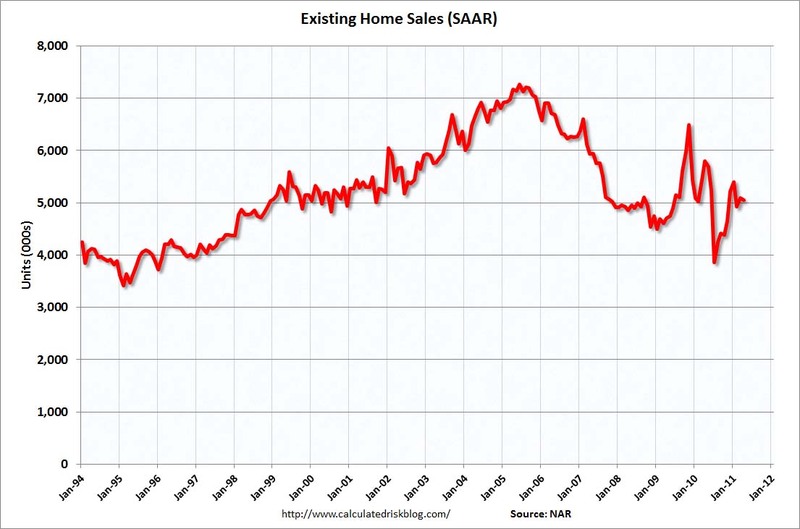 Might home sales pick up again in a couple of months? Perhaps, but I doubt it. I simply do not see any compelling reason for the marginal home buyer to make that purchase. By September, we will be fighting seasonal factors. 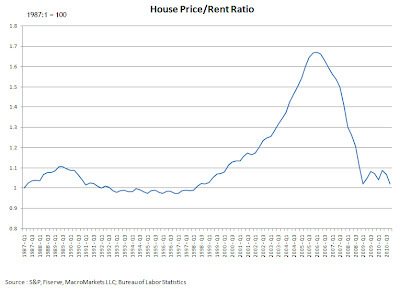 The exception is the key bubble bust regions, where foreclosures are driving prices as much as 50% off the peak prices. But I am unconvinced about prices in general. 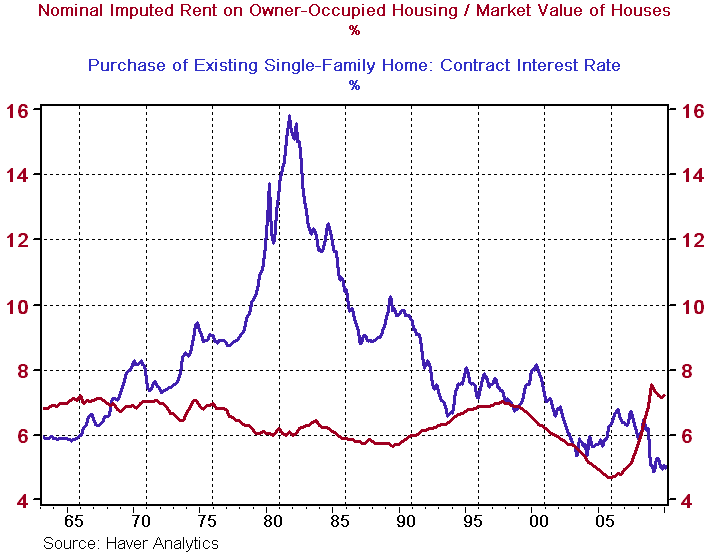 My problem with imputed rent is that it is not independent of demand for home purchases; Imputed rents interact with home prices, credit availability, pricing trends, employment, etc. 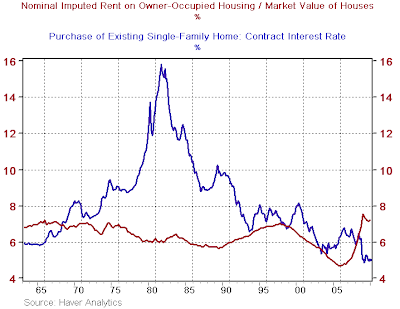 Indeed, one can easily imagine a scenario where: 1) Home prices are thought of trending lower; 2) Credit is tight; 3) Employment is weak; 4) Wages are flat. This would create an environment of relatively soft demand for home purchases (sending their prices lower) At the same time, this would increase demand for rental units. 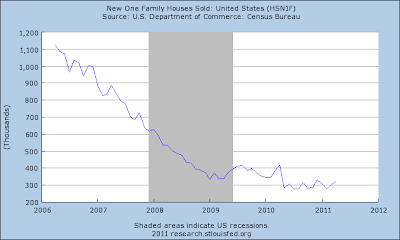 While still very low, new home sales have leveled out for the last two years. Existing homes sales have a median rate of around a 5 million annual rate (+/- 150,000 or so) -- even when you include the dislocations from the first time home buyer tax credit. 2.) The sales pace for both new and existing homes -- while low for new and while pretty low for existing -- has been at a pretty consistent pace, even when you include the tax credit distortions. 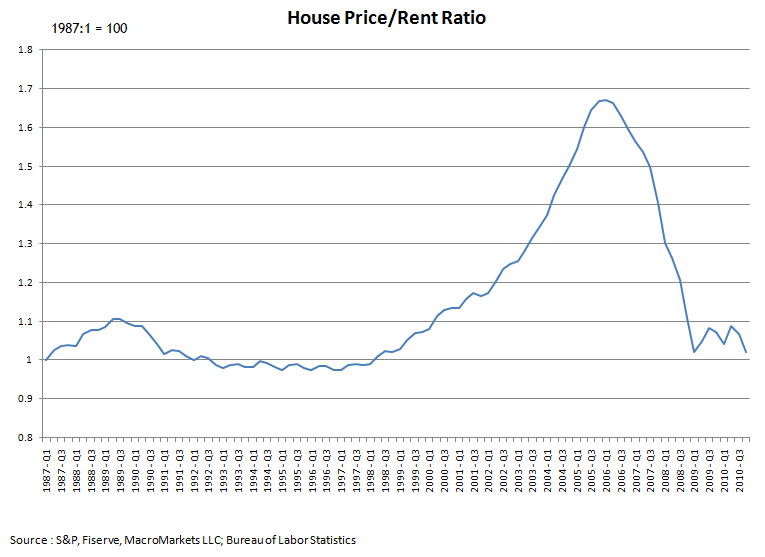 Going forward, I think prices are cheap enough to continue to bring buyers into the market. But, I don't think there will be a big pop in demand because of the overall macro situation. So, I think the current sales pace will continue barring an unforeseen shock and the prices may fall a bit more (say 10%-15%) but that if we're not at the bottom, we're pretty close. Dr. Copper is feeling under the weather. But will his ailment prove fatal? The charts don't look good for the metal widely regarded as having a Ph.D. in economic forecasting. Monday's 3.1% fall in the Comex front-month copper contract, to under $4 a pound, pushed it back below the 200-day moving average, a closely watched support level. Worse, the shorter-term, 50-day moving average has been dropping pretty steadily since late February. The dreaded "death cross" looms, when the short-term average drops below the long-term one, portending sustained weakness. Any prognosis must rely on more than charts, however. 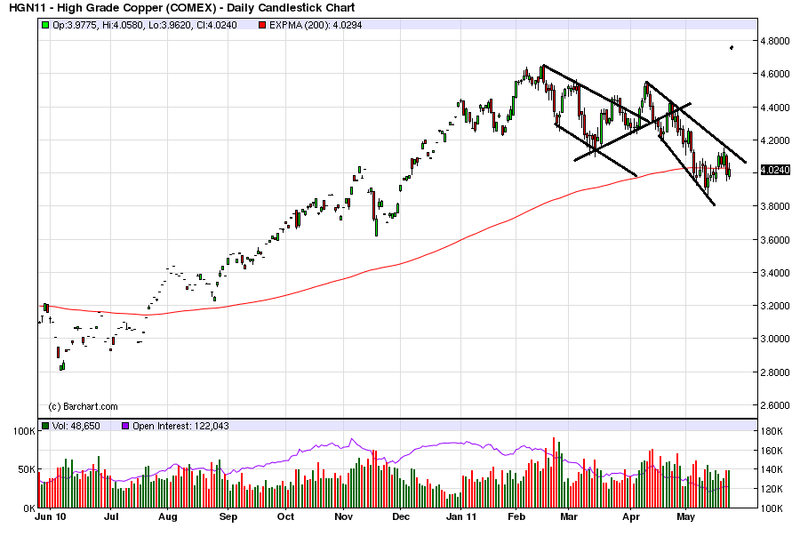 Copper's last death cross, just under a year ago, didn't bury the metal. By September, the 50-day average had moved back above the 200-day indicator, as copper entered a seven month bull run. By mid-February, the copper price had risen 54% and surpassed its 2008 peak at the height of the precrisis commodities boom. That last run upward, however, coincided with a couple of things. First, the Federal Reserve's second round of quantitative easing, or QE, drove U.S. real interest rates decisively lower. By weakening the dollar and reducing the opportunity cost of holding nonyielding assets, this made metals a relatively attractive investment. Second, Chinese inventories of copper were restocked during the second half of 2010, according to Deutsche Bank estimates. Copper's overall importance to the economy as a whole makes it a very important commodity -- and one who's price needs to be monitored. The longer term (1 year) chart shows several pieces of important information. First, prices are right at the 200 day EMA. Secondly, prices have formed a down up down pattern that shows a fairly disciplined sell-off. This indicates there is no panic selling going on. The shorter chart shows that all the shorter EMAs are all moving lower with the shorter below the longer. Prices are also right around the 200 day EMA, indicating there is a question about whether the market is going to move into bearish territory or remain bullish. Although the MACd has given a buy signal, it is still giving an overall weak reading, indicating there is little strong upward momentum right now. Overall, this is a fairly weak chart, but it also shows a pretty disciplined sell-off, indicating the liquidation is pretty orderly. This looks very much like a "wait and see if the economy slows considerably" move. One of the refrains from the last few years has been that "Banks need to write off hundreds of billions of dollars of bad loans so that their balance sheets can be repaired and they can afford to loan money again" and until they started to increase loans, there could be no recovery. fell on deaf ears. After all, that was just another "pretty graph." For the first time since the economy fell off a cliff in late 2008, total bank loans are at a new 13 week high (the 3/31/10 vertical scrape is due to a change in definitions). This 3 month period is the longest that bank loans have been flat since that time as well. 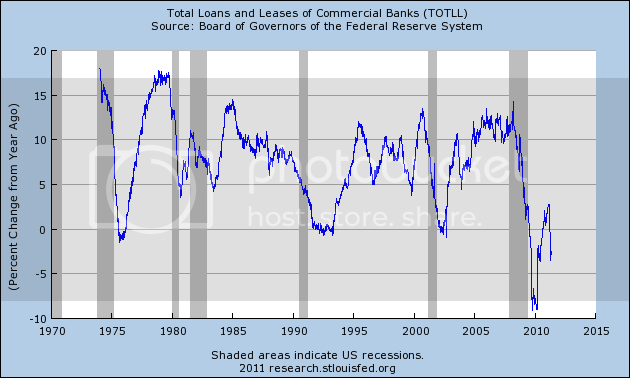 Commercial and industrial loans made their bottom last year. 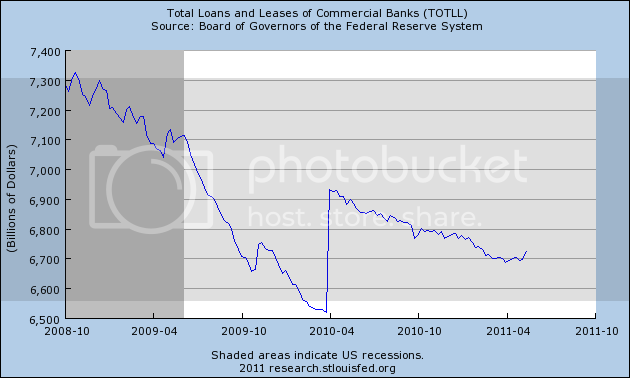 No guarantees, but it appears that total bank loans have finally made a bottom. Pretty graphs (which are just a convenient way to show data) kick Doomer a** again. [T]he fact of the matter is, barring some miraculous act of God in coming months, around half of all U.S. homeowners with mortgages (or, approximately 35% of ALL American homeowners—that’s somewhere in the neighborhood of 60-70+ million present and former members of the U.S. middle class) will be underwater (owing more on their homes than they’re worth) by the end of 2011. 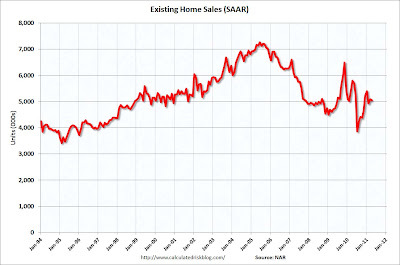 (Zillow’s telling us the number’s around 28%-29% as of Q4 ’10 and/or Q1 ’11; Rasmussen notes that more than half of the mortgageholders in the U.S. think they owe more on their homes than they’re worth, right now.... I believe we’re somewhere in-between, but well on our way to 50% of all mortgageholders being underwater, by some point later in the year. The number of homes with negative equity rose to 16.2 million in the first quarter from 13.1 million a year earlier, Zillow said. Experts quotes in the article expected housing prices to fall as much as 11% for the entire year of 2011, which is almost half over. 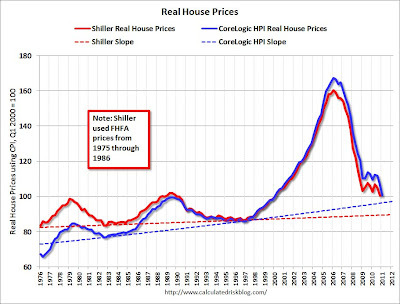 Let's do the math: according to Zillow, the ratio of underwater mortgaged households to decline in prices from peak was 22%:25%. Now it is 28%:33%. This is actually a fairly stable relationship of ~8:10, where 8/10% of homeowners go underwater for every 1% decline in prices off peak. According to the Pied Piper of Doom, another 22% of homeowners are going to be underwater in their mortgages by the end of this year! (28% +22% = 50%). If the above ratio continues to hold, that means the Pied Piper of Doom is calling for a decline of another 25% in prices from peak in just the next 7 months! This is patently ridiculous, and is triple or more the decline called for by the experts cited in the very article he highlights. Meanwhile, in April Las Vegas had the highest number of house sales in five years. P.S. : I know some readers don't like my ripping this particular blogger, but I reserve the right to go after him just as I go after Mish or Zero Hedge or any other math-challenged Doomer; and I know that some other readers also read him, still believing against all evidence that he has some credibility as a forecaster. 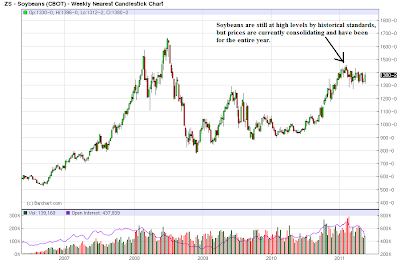 I believe one of the reasons for the current slowdown is high commodity prices. And while oil an gas get all the attention, I believe that food prices share a fair amount of the blame for the latest slowdown. As I noted a little over a week ago, the latest retail sales figures show that food spending is still increasing at the expense of other retail consumption. So -- let's take a look at the long-term charts of the three grains -- wheat, corn and soybeans -- to see where we are in the price cycle. 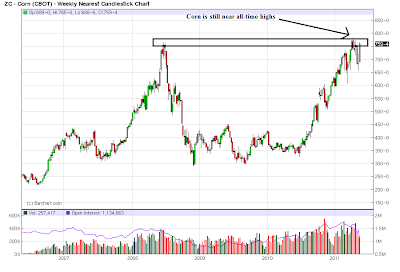 Corn is near all-time highs. 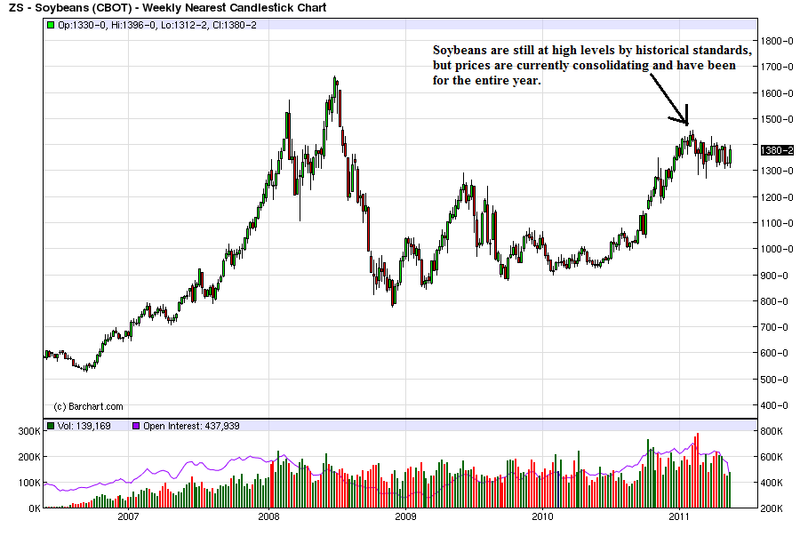 Soybeans are near an all time high, but haven't made a strong advance this year and are currently consolidating. 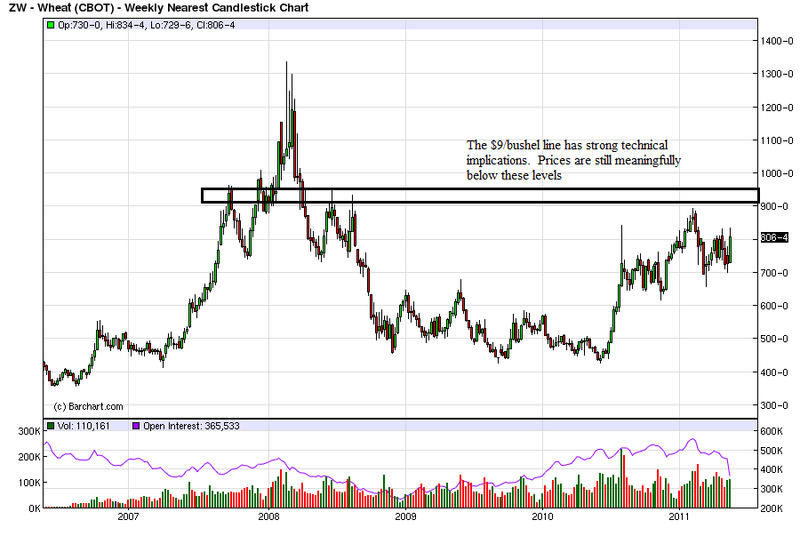 Wheat is off from highs, and hasn't made a strong move higher all year. Funds cut their bets on higher commodity prices by 15 percent in a week after the worst rout in two years, reducing positions in everything from copper to oil on mounting concern that global growth is slowing. The funds held a net 1.23 million contracts across 18 U.S. commodity futures as of May 10, the lowest since July, data from the U.S. Commodity Futures Trading Commission show. The net-long position in crude oil slumped 13 percent in a week, while for copper it fell 59 percent and in silver 23 percent. The Standard & Poor’s GSCI Index of 24 commodities fell 11 percent in the week ended May 6, the biggest drop since December 2008, as investors fretted about the end of monetary stimulus in the U.S., higher interest rates worldwide and Europe’s sovereign debt crises. At least two dozen nations and the European Central Bank raised rates this year, data compiled by Bloomberg show. The “pressures that have been building in emerging markets in terms of inflation and rapid interest rate hikes, coupled with the end of the quantitative easing program in the U.S. plus what’s going on in Europe, we have a lot of uncertainty around the extension of aid to Greece, you put all that together, that doesn’t paint a very rosy picture,” said Francisco Blanch from Bank of America-Merrill Lynch. My analysis of the Treasury market has not changed. The market is moving higher, but keep the stops tight. Also remember that yields are dropping, and we're getting near levels when yields shouldn't be moving much lower without a change in the fundamentals. I'd still use 2.75 on the 10 year as the absolute lowest yields can go in the current environment. On the longer term chart, notice that prices are now above key resistance areas and have a fair amount of room to run higher. The shorter chart shows that with the exception of a dip to the 20 day EMA, prices remain in a strong uptrend. All the EMAs are moving higher and the shorter EMAs are above the longer EMAs. Prices are using the EMAs for support rather than resistance -- another sign of a rally. The underlying techncals are pretty strong, with the A/D moving higher and the CMF confirming the inflow of money into the market. There is some weakness with the MACD, as it might be close to giving a sell signal. 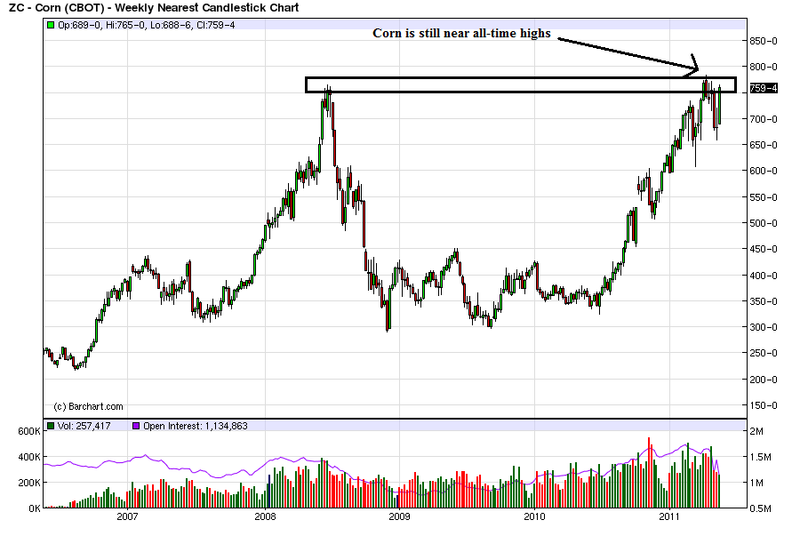 The Treasury market is benefiting from concern about the stock market and the EU situation. Interestingly enough, there does not appear to be any concern on the part of bond traders regarding the budget situation in Washington. 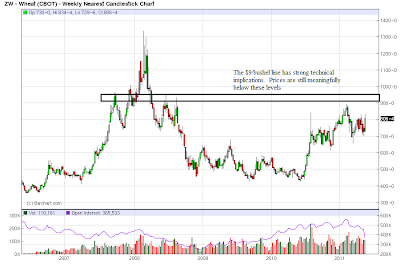 However, as I mentioned last week, remember that on the other side of price is yield. I would use 2.75% as the possible low on the yield front, but that's simply a decent round number to use. It's important to remember that on the fundamental front, the Treasury market is the primary market to invest in right now. As such, it's benefiting from the increased concern about the economy and the EU situation. The huge drop down is obviously the earthquake. Since the, the market has been trading sideways. We have a triangle top forming, but the lower line of the consolidation pattern is still emerging -- and could go below support at the 9.8 area as well. The point of this chart is to remind us that Japan is still digging out from an earthquake. This process will take some time. Additionally, Japan's economy wasn't doing that well to begin with. Will There Be A Second Half Rebound? Stocks, commodities and other risky investments have sold off in recent weeks amid worries about slowing global economic growth. But the relatively tame downturn in stocks is evidence that many investors expect the rally to resume in the coming months. These investors don't expect the market to match its powerful rally in the first four months of the year, when the Dow Jones Industrial Average was up 10%. Instead, they are betting that the economy will rebound from a sluggish patch and nudge markets higher at a more restrained pace. The expected catalysts for the rebound are lower energy prices, caused in part by the slowdown itself, and gradual improvement the U.S. job market. In addition, corporate earnings and balance sheets remain healthy, which should provide support for both the economy and a floor for stock prices. The optimism does have a deja vu feel about it. Call it the myth of the second half. Every year, no matter how the market does at the start, investors convince themselves their losses will be erased or their gains magnified by a strong second half. "The markets are asking the question as we see growth slowing, 'do we trace that into growth becoming negative or into growth slowing and then accelerating?' " says Noah Weisberger, head of macro equity strategy at Goldman Sachs Group. "Our core view remains that we reaccelerate, but until that becomes clear the markets may be worried." Mr. Weisberger says slowdowns in the middle of economic recoveries are common, and Goldman has broken them down into three parts: deceleration, stabilization and reacceleration. Right now, the economy is still decelerating from its strong snapback at the start of the recovery. Mr. Weisberger is waiting for the shift from deceleration to stabilization, at which point Goldman will recommend that investors make riskier bets. Until then, investors should be braced for whippy trading at least through midyear and acknowledge that riskier investments could fall further before recovering. The modest downturn in the face of bad news may itself make the market more jittery. The Dow Industrials are down just 2.3% in May even though they just finished their worst three-week stretch since last August. The article hinges most of its argument on lower gas prices. This is in line with Professor Hamilton's research on the topic. However, prices will have to drop for a significant length of time -- that is, they must drop long enough to change consumer behavior. Most state budgetary years run from June 30 to June 30, so we are rapidly approaching the moment of truth where we find out how badly states are harmed by the ending of federal assistance. Two months ago when I last looked at this issue, we only had data through the end of last year. It appeared that state budgetary problems, while bad, would not be quite as bad as originally feared. Now we have the final data through last December, preliminary data for the first quarter of this year, and at least some raw information about April. So let's revisit the situation. State tax revenues grew by 7.8 percent in the fourth quarter of 2010, compared to the fourth quarter of 2009, according to Rockefeller Institute research and Census Bureau data. This is the fourth consecutive quarter that states reported growth in collections on a year-over-year basis. Forty-two states reported tax revenue growth during the fourth quarter, with nine showing double-digit growth. Preliminary figures for January and February 2011 indicate further strength in state tax revenues this year. Overall collections in 45 early-reporting states showed growth of 9.5 percent compared to the same months of 2010, and 7.5 percent compared to the same months of 2009. Based on the seasonally and inflation adjusted chart of real state revenues I prepared for my last article, which showed the first calendar quarter of last year 12.6% off the peak, and two years ago 12.8% off the peak, the January - March quarter of this year was around 3.1% to 5.3% below state revenues' April - June 2008 peak. Newspaper articles from the last month strongly suggest that the positive surprise in revenue growth continues. The office of the state budget director reported ... that April's General Fund tax revenue grew by nearly 8 percent compared to year ago figures. That means total revenues for the month were $844 million - compared to $782 million in April 2010. Tax receipts have grown 5.6 percent for the first 10 months of the current fiscal year. Road Fund tax revenues for April were $116 million, a 7.6 percent increase over April 2010 figures. Year-to-date tax receipts for fiscal year 2011 have increased by nearly 12 percent over last year. State officials are reporting an unexpected $2-billion surge in tax receipts that will help lawmakers close the remaining $15-billion budget deficit, and the Capitol is humming with hope that more is coming. The Commonwealth of Massachusetts hauled in April tax receipts that were $580 million above expected estimates, according to a Massachusetts Department of Revenue announcement today. Collections for April 2011 totaled $2.505 billion, up 43.4 percent from the same period last year. David J. Rosen, chief budget officer for the nonpartisan Office of Legislative Services (OLS), told the Assembly Budget Committee yesterday morning that state tax revenues would be $913 million higher than Gov. Chris Christie anticipated in his March budget message. The surplus, he explained, comes courtesy of a huge two-year surge in income tax revenues, which would more than make up for a decline in corporate tax revenues in fiscal years 2011 and 2012.
economic forecasters on Thursday said they see improvements in the state's economy. And they made their optimism official, projecting an increase in the overall amount of revenue the state will bring in the rest of this year and in the 2011-13 budget years. Some of the board's positive outlook came from what the state Department of Revenue said it has seen since April 18 in individual income tax growth. But there are other defining factors that the six members of the Nebraska Economic Forecasting Advisory Board considered in projecting an $82.5 million increase in revenue for this fiscal year, and a $146.5 million net gain to the state's bottom line in the two years after. Lawmakers will have an additional $1.2 billion to spend during the next two years, Comptroller Susan Combs told state leaders Tuesday. The revised revenue estimate will ease pressure on legislators working to craft a budget compromise before the session adjourns May 30. But it’s not nearly enough to eliminate dramatic cuts and layoffs across all levels of state government caused by a revenue shortfall that was initially projected to be $15 billion — or $27 billion when calculating the costs of maintaining services for a growing population. Most of the higher revenue estimate comes from a dramatic rise in sales tax receipts during the past year. The high price of oil also has helped fill the state coffers. The bottom line: state tax revenues continue to surprise to the upside. 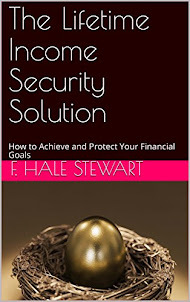 But it still won't be enough to avoid some real financial spending crises in a few particularly hard-hit states such as California and New York, where steep declines in personal income tax collections are responsible for almost the entire shortfall compared with 2008. Florida's gain over 2008 is no error - it has no personal income tax. In short, none of the other markets are giving us any hope for an upside break-out. 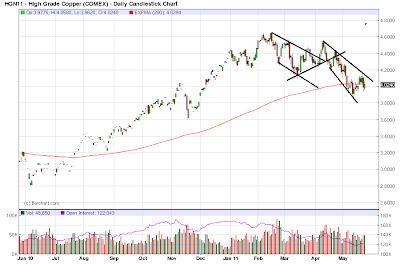 I would treat the equity markets as currently consolidating we they wait to see what the overall economic direction is. The IWMs -- the riskiest of the largest averages -- have broken a long-term trend line. Remember, this average led the market higher over the last year or so. There are two possible long-term trend lines with the SPYs. The lowest connects the lowest shadows of the two candles while the second, slightly higher line connects the low point of the bodies. Either way, the chart indicates the SPYs are in very touchy technical ground and need to be monitored closely. The QQQs -- much like the SPYs -- are also at very touchy technical levels. The SPYs have broken a shorter-term trend line. In addition, the 10 and 20 day EMAs are now moving sideways as opposed to higher, indicating slower upward momentum. The A/D and CMF lines show a lack of volume moving into the average and the MACD has given a sell signal and has continued to decline. 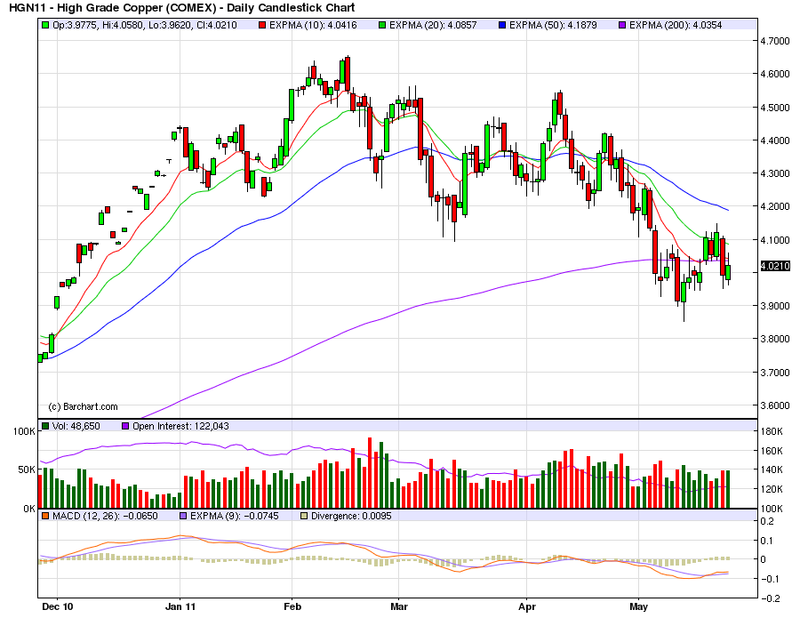 Right now, the primary line of support is the 50 day EMA. The IWMs have many features similar to the SPYs. However, take special note of the EMA picture, as the 10 day EMA has moved below the 20 day EMA. Also note that both the shorter EMAs are now moving lower rather than sideways. In short, the technicals of the market are now signaling more caution signs. Important, long-term trend lines have either been broached or are currently very close to being broken. Underlying technicals (A/D, CMF, MACD) are weakening. This mirrors the issues with the fundamental economy right now, which is also showing signs of weakness. In short, I would not be looking for any long opportunities right now. If you've made money over the last few months, I'd take some profits off the table. And I'd also be looking for a shorting opportunity if it presented itself.